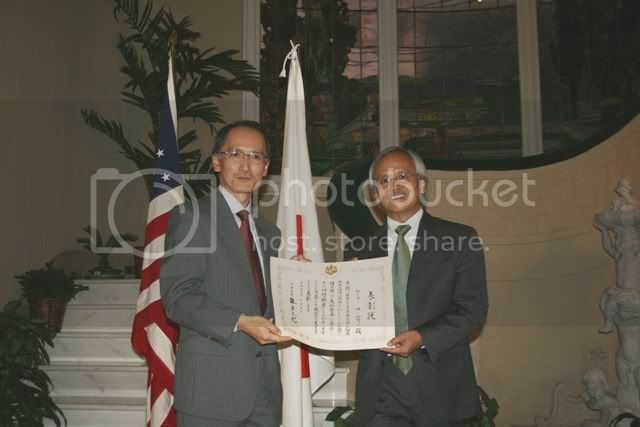 The Consulate General of Japan in San Francisco presented the Foreign Minister's Commendation to Mr. Gary Mukai on October 5, 2007. Consul General Yasumasa Nagamine presented Mr. Mukai the Certificate of Commendation and silver cup at the award ceremony at the Consul General's official residence. The ceremony was followed by the reception in honor of Mr. Mukai. Mr. Mukai is the Director of the Stanford Program on International and Cross-Cultural Education (SPICE), and over many years has greatly contributed to the promotion of mutual understanding between Japan and the United States, especially in the field of education. Furthermore, in recognizing the importance of enhancing cross-cultural understanding, Mr. Mukai has continued to lend his energy and expertise to actively supporting and implementing the goals and objectives of the Japan Exchange and Teaching Program (JET Program) and the activities of the JET Alumni Association of Northern California. In recognition of his ongoing contribution and dedication, the Minister for Foreign Affairs of Japan honored Mr. Mukai with this commendation. The Foreign Minister's Commendation pays tribute to the meritorious services of individuals and groups who through their endeavors in various fields, play a large role in promoting relations between Japan and other countries and enhancing understanding and support for these activities.